Use leveling feet at the four corners of the server to stabilize the server to the floor. Turn the wrench clockwise to loosen the 19-mm locking nuts. When tightened, these locking nuts prevent the leveling feet from being raised or lowered, so loosen these nuts before lowering the leveling feet. 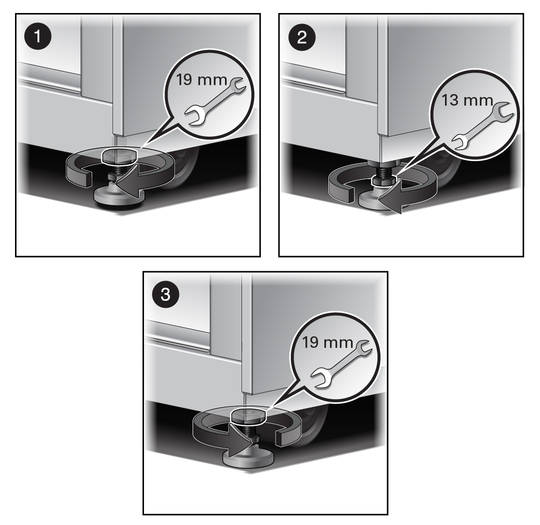 Use a 13-mm wrench to lower each leveling foot to the floor. Turn the wrench clockwise to lower each leveling foot. When correctly lowered, the four leveling feet will support the full weight of the server. After lowering each leveling foot, use a 19-mm wrench to secure the 19-mm locking nut to the server. Turn the wrench counter-clockwise to secure the locking nut. Note - If the leveling foot begins to rotate and move upward, use a 13-mm wrench to hold the leveling foot in place while you tighten the 19-mm locking nut.